iCases are action mazes on the web which deliver complex and engaging learning. They give students the opportunity to interact with experimental data in a realistic context. For example, with limited time and money, students must decide what tests are needed to resolve a complex situation typical in biomedical sciences. Research is needed before students can begin the case, background information and references are provided. A simple quiz is used to show that they are ready to proceed to the case itself. iCases can be used either for self-study or, in the case of Viral Outbreak and Genetic Typing (below), moderated by demonstrators as a replacement for a laboratory practical. iCases are written using third-party software (Quandary by Half-baked Software) which is very easy to use, even by people with very limited technical skills. MSD-LT have modified this to support a number of additional features. 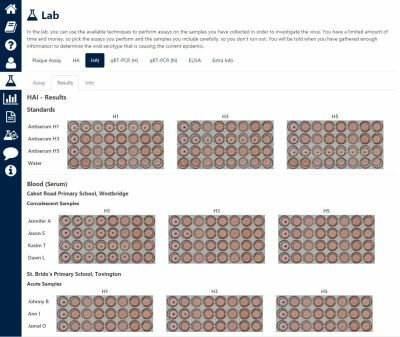 Viral Outbreak aims to encourage students to see the big picture and concentrate on the science of a viral outbreak rather than simply following an experimental 'recipe' as many had done in the laboratory practicals that this exercise replaces. Users adopt the role of a Health Protection Agency scientist faced with a Viral Outbreak. From a wealth of resources, including videos of experts explaining important virological techniques, users research the background to the case and the underlying basic science. Before proceeding further, they take a test to ensure that they have understood. Students then decide which samples need to be collected, without causing unnecessary distress to the infected school children. They then must choose an acceptable combination of assays to perform on the samples in order to determine the viral serotype. With a limited budget, and a deadline to meet, they need to choose carefully. A report explaining their conclusions to 'The Minister' is marked by demonstrators online and students receive marks and feedback online. The Viral Outbreak iCase has been selected as an Open Educational Resource (OER) by the Higher Education Academy (HEA) Biosciences and is currently used routinely by Exeter Medical School. The implications of blood group incompatibilities for blood donors, transfusion recipients, mothers and infants. Two Graduate Entry Medicine students, Emily Adams and Caroline Rodgers, developed a series of iCases to help with identifying 'red flag' symptoms in a general practice setting. Subjects covered: Lower Back Pain; Cardiovascular Risk; Dysuria and Gastrointestinal Problems. Access on request – please contact us for details. Adams EC1, Rodgers CJ, Harrington R, Young MD, Sieber VK, 2011. How we created virtual patient cases for primary care-based learning. Med Teach. 2011;33(4):273-8. Aims to test and improve students’ understanding of the urinary concentrating mechanism with the aid of a simulation of the sequence of events that underlie the countercurrent multiplication mechanism. The genes responsible for a large number of single gene defects have now been identified and many different mutations described. In many cases, mutation detection is relatively straightforward and the pathogenic consequences of the mutation are quite obvious. However in a significant number of cases, the causative mutation may be extremely difficult to identify, or a sequence change may be found, but it may prove very challenging to establishing that it is pathogenic. In this iCase, students analyse the PDHA1 gene in a patient with pyruvate dehydrogenase deficiency. This involves analysing the sequence of parts of the gene and using a number of different on-line bioinformatics resources to establish if any sequence changes could be responsible for the enzyme defect and therefore the patient’s disease. One of the aims of the iCase is to introduce students to the wide range of analytical tools which are freely available on the internet for investigation of patients with genetic diseases. Two iCases covering cervical screening and subsequent investigations and treatment developed by Dr Katherine Gee. One is supported by videos of a doctor explaining the procedures, the other by videos of patients – students are split evenly between the two and then their performance in a linked OSCE is assessed. Access on request – please contact us for details. Cases based on clinical scenarios to encourage integration of knowledge and clinical reasoning, covering joints; muscles; reproductive anatomy; and urinary anatomy. Each case begins by outlining a clinical presentation and a properly collected history was narrated. Questions are set concerning the basic concepts underlying the problem in several fields (gross anatomy, histology, imaging, physiology, endocrinology and pharmacology) and a series of investigations are decided upon by the “physician”. The results of these investigations are then presented, questions set around the results as before and a diagnosis reached. Interested in using our Creative Commons iCases at your institution? iCases is an LTI Tool Provider, and so can be integrated into any VLE/LMS that conforms to the LTI standard. User access will then be controlled by the VLE/LMS. We can, on a limited basis depending on demand, provide accounts within WebLearn (the University of Oxford's VLE) for use by your users.